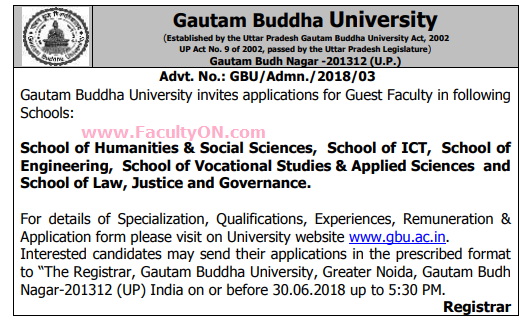 Gautam Buddha University, Greater Noida has advertised for recruitment of Guest Faculty jobs vacancies. Interested and eligible job aspirants are requested to apply on or before 30th June 2018. Check out further more details below. About University: Gautam Buddha University was established under the Uttar Pradesh Gautam Buddha University Act, 2002 U.P. Act No. (9) of 2002, came into existence in the year 2008. The University is funded by the New Okhla Industrial Development Authority (NOIDA) and the Greater Noida Industrial Development Authority (GNIDA), the undertakings of the Government of Uttar Pradesh. How to Apply: Interested and eligible candidates are requested to send application in prescribed format along with copies of certificates / supportive documents card and recent passport size photos to the postal address mentioned below.